Before reaching my final destination of St Barth, I stayed for one night in St. Martin at the Sonesta Beach Hotel – Mahoe. This hotel is not even one minute from the St. Martin irport and is both clean and comfortable. I confidently recommend it to all who may be required to stay overnight in St Martin. Good restaurants and gambling are all within walking distance of the hotel. When I finally arrived at St. Barth and later villa WV REV, it was comforting to have Wimco staff there at the airport waiting for me. We had a delightful lunch at La Gloriette located on Cul de Sac Lagoon beach under the leaves of the Cocoloba Trees. I love this restaurant for the view and people watching. It is a locals’ place so you know the food is good. Everyone should experience La Gloriette and its neighbor O’Corail. 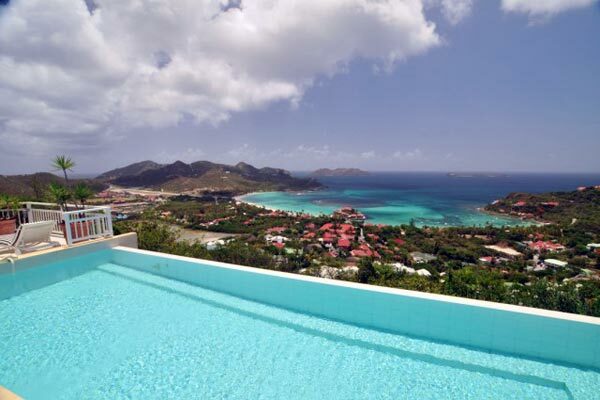 Villa WV DAT is a 3-bedroom villa with clear views to the islands beyond. It is located just above the ocean with lots of privacy, but is close enough to walk into Gustavia for shopping and dining. Villa WV VNA is a 7-bedroom estate that families will love. There is a pool, gym and ping pong table to enjoy in this private Camaruche villa. Villa WV CDM was recently redone and would be a perfect destination for friends traveling together. All 3 bedrooms have ocean views and there are comfortable gathering areas inside and out. Have a chef cook dinner in the villa one night. We had a wonderful dinner with Chef Nick from Fabulous Feast. An in-villa massage – La Ligne does a great job.